[Episcopal News Service] Relief efforts still are underway in Hawaii more than two months after the Kilauea volcano began erupting, and people interested in helping the cause are taking inspiration from a 7-year-old boy and his coin jar. Since May 5, the lava flows have destroyed more than 700 homes, sent dangerous toxins into the air and displaced a community of about 1,500 people on the Big Island of Hawaii, according to CNN. The island congregation of St. James’ Church, though not directly affected by the volcano, has joined in the relief efforts by collecting items from a list of needed supplies, such as bottled water, diapers and toothbrushes. The boy’s family often attends the beach-side service held by St. James’ every Saturday evening. After one of the services in late spring, the Rev. David Stout, rector of St. James’, was loading relief supplies into his vehicle when Jonah approached him and asked for help with the items he was donating – every item on the church’s list. Soon the full story of Jonah’s “giving jar” was revealed. His grandparents had given him the jar at Christmas with more than $200 in loose change. They said he could keep the dimes, but the other coins had to be set aside for times when he found people in need. “Their biggest hope is that Jonah will have fun giving,” Marilyn Eigner, who also attends the beach services, said in an article about Jonah in the congregation’s newsletter. After the Kilauea eruption, the congregation had included in its newsletter a list of nearly 20 items needed for the relief efforts. Jonah’s mother showed him the list, thinking he would just pick one to buy, but instead he spent about $50 from the coin jar to buy all of them. 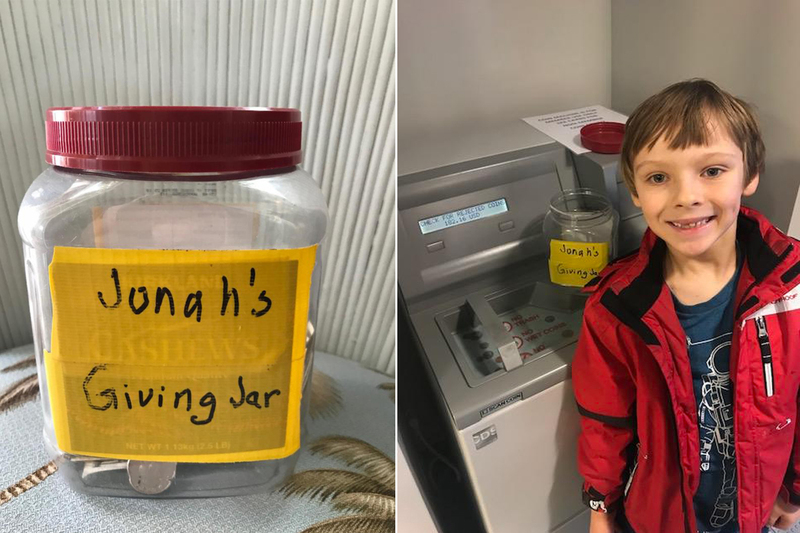 Jonah now puts 10 percent of his allowance into the “giving jar,” and his story is clearly paying dividends for the people affected by the volcano. “We are so touched that Jonah inspired so many people,” his mother, Rachel Grenier, said in an email to ENS. “It is such a wonderful reminder to us all that anyone – regardless of who we are, where we are or how old we are – can make a difference, and that even the smallest act has the potential to create huge positive momentum. The Church of the Holy Apostles, the closest Episcopal church to the lava flows in the Puna District, also remains active in the relief efforts. Holy Apostles, with help from Episcopal Relief & Development, has participated in a clean laundry drive for people displaced by the volcano, and the church is hosting a fundraiser Aug. 26 for money to build a tiny homes village. Episcopal Relief & Development also has partnered with the Diocese of Hawaii to provide emergency assistance in the area near the volcano. What can I say,(tears in eyes) he’s an Eggleston! David, I would think St. Jude’s would be closer. They have showers every Saturday for people in need and in addition feed them soup and bread. Some one should write that up. Maybe we can get Giving Jars placed in Congressional offices to encourage contributions for recovery of all those citizens in PUerto Rico who are still without water, electricity, health care, jobs etc.